This weekend Dan took the kids out for breakfast and then all three kids to the grocery store (a feat in itself!) while I completed my final case study for my lactation program and took my final exam. I passed the final and just got the feedback that all of my case studies were approved. I'll receive my certification on Tuesday. Afterward, I went to get ready for the day and when I came back into the kitchen my whole family was home and this was waiting for me on our kitchen island. The gold artistry is by Dan. 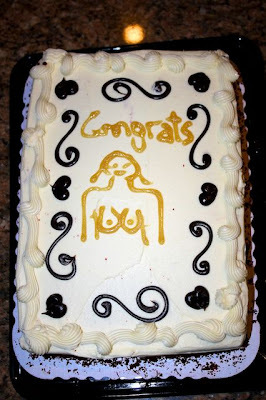 He said he thought about asking the people at our local bakery to do it, but he didn't think they'd go for it. Awesomest graduation gift ever! 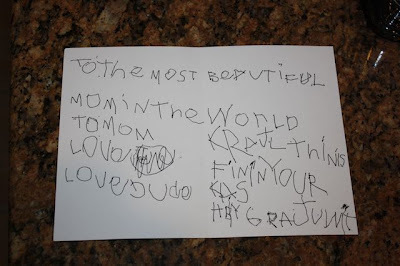 Both kids gave me a card but Jude's was one of the sweetest things I've ever received. He wrote it all himself. Be still my heart. Is this kid gonna be Casanova someday or what?! Many thanks to my fantastic family for a very special day! So happy for you! It's a tough thing to do with 3 kids and being pregnant, but you are amazing!!! dan cracks me up!!! congratulations!!!! Just happened upon this post and I just have to say...BEST...CAKE...EVER! Go Dan!